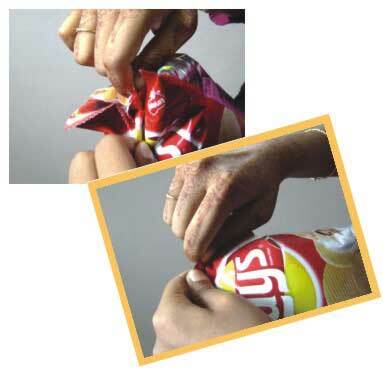 Many branded potato chips sold in pillow pouches cause problem because opening those packet requires considerable amount of pinch grip strength. These packs have some extra air filled in them to create an illusion of a heavily fill inside. Moreover, in many packs there is no indicative mark for opening. So, users try their own inefficient ways of opening a pack and many a times it opens up with a burst resulting in embarrassment.